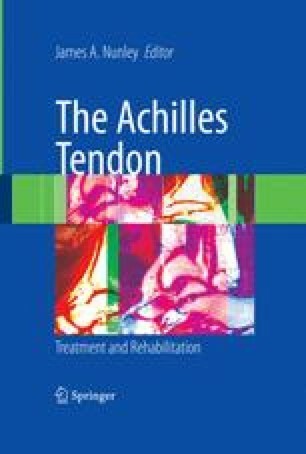 The Achilles tendon is the conjoined tendon of the two heads of the gastrocnemius and the soleus muscle. Together these structures are often referred to as the “gastroc-soleus complex.” It is the largest and strongest tendon in the human body and subject to tensile forces of up to 12.5 times body weight (9 kilonewton [kN]) during sprinting1 and six to eight times body weight during athletic activity such as jumping or cycling.2 Due to its size and functional demands, the Achilles tendon is susceptible to both acute and chronic injuries and is directly or indirectly implicated in many pathologic conditions of the foot and ankle. To diagnose and treat these disorders, a thorough knowledge of the anatomy of the Achilles tendon and its surrounding structures is crucial.